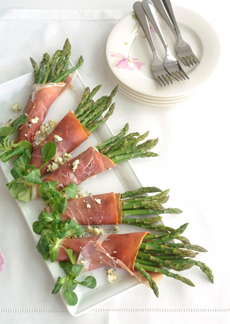 We love these delicious, fancy yet very easy Asparagus & Prosciutto Wraps. Photo courtesy Castello USA. Need something fancy—and easy? Here’s a lovely first course to make with spring asparagus. We serve the wraps individually plated with some watercress salad, to which we add some snipped chives or thin-sliced green onion. The recipe is from Castello Cheese, which crumbles their Danish blue cheese as a garnish. 1. TRIM the woody ends from the asparagus. Bring a large pot of salted water to a boil. Blanch the asparagus for 30 seconds (90 seconds for thick spears), until the asparagus just bends. Alternatively, lightly steam the asparagus in a microwave. 2. PLUNGE the asparagus into ice water to stop the cooking. Blot dry with paper towels and set aside. 3. WHISK together the olive oil, vinegar and garlic and roll and marinate asparagus in vinaigrette 30 minutes at room temperature. Make extra vinaigrette if you are serving the watercress. 4. GATHER the asparagus into bundles of 8 (if thin, 4 if thick) and wrap each bundle with a prosciutto slice. Arrange on a platter or individual plates. Decorate with crumbled blue cheese. 5. TOSS the optional watercress with vinaigrette and add to the plate. 6. PASS a peppermill for fresh-ground black pepper. This is a complex question, because the authentic breeds of pig and curing techniques differ in Europe from what is permitted in the U.S. But a simple answer is: Both products are air-cured hams, with some differences in the breed and diet of the pig. Prosciutto, from Italy, tends to be fattier and more mild. Serrano, from Spain, tends to be more flavorful. But it’s hard to state something definitively when you buy the product in the U.S. The best approach: Buy a small amount of each and decide which you prefer. If you’re buying it freshly carved (not pre-packaged), ask the counterperson what the brand is, and keep notes. *Slender asparagus are easier to wrap; but if you can only find thick spears, use half as many.